Make sure that you are properly registered for the exam. Check the time, date, and place of the exam. If you are specially nervous, locate and visit the building. Study past papers as a normal part of revision. Don’t stay up late into the night ‘cramming’. Get a good night’s sleep to be fresh the next day. Don’t try absorbing any completely new material. Use the time for a general overview of your course. Avoid novelties: stay close to your normal life-rhythms. Assemble any materials you need for the next day. Take a selection of differently shaped pens. This can ease the pressure on your fingers and thumbs when writing. Take spares, a ruler, rubber, and any instruments you might need. Settle in as quickly as possible, and avoid distractions. Check the instructions and rubric on the exam paper. Confirm that the structure is what you expect [number of questions to be answered, time allocated]. Remember that the time allowed includes the time for reading the paper and preparing answers. You need to make your choices and get started as quickly as possible. However, you should start with an overview of the paper. Identify those questions you can answer or prefer to attempt. Eliminate those which you can’t answer or prefer to avoid. When you have eliminated questions, you have less material to deal with. Analyse the questions as you would do for course work – but do it quickly. Some choices can be made [almost unconsciously] whilst you are writing. Stick to those topics you have revised: don’t try something new. Leave room for making changes as you go along. The easiest strategy is to start with your favourite topic. This will give you a sense of confidence, and promote your fluency. You will also gain marks easily. However, you might start with a more difficult question, and save your favourite as a ‘reward’ for later. This strategy has the advantage that you are tackling the more difficult question in a fresher state. Remember that you might have ideas about one topic whilst writing about another. Make an outline plan or brief notes for your answer(s) in the exam booklet. 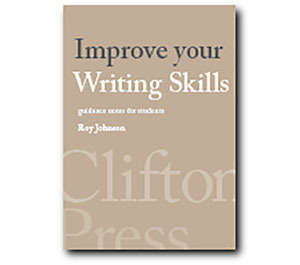 This provides guidance and a reminder to which you can refer whilst writing. Examiners may be prepared to give you credit for a plan if your answer is unfinished. If possible, prepare brief plans for all your answers. You can then add notes or examples as you are going along. Some exam booklets might specify that notes should only be written on the outside and inside covers – as in the following example. If regulations permit, write your answers only on right-hand pages. Leave left-hand pages blank for notes, corrections, or later additions. Write as much as possible on each question. If you finish a question early, either think up more to say or go on to the next question. If you go on to the next, leave blank space on the page for possible later thoughts. Firm and concise answers are better than those which wander aimlessly just to fill up the page. Keep an eye on the time allocated for each question. Write as clearly as possible: examiners are easily irritated by untidiness. It is easier to score the first half of the marks for any question than the second. A firm structure will help to clarify your arguments. If you finish the paper early, use the time left to check and edit your work. Spend at least the last few moments glancing over what you have written. Check for possible mistakes of fact, grammar, and punctuation. Correct mistakes as neatly as possible. Don’t scribble. Write any additions on the left-hand page, and show insertion points clearly.